Dear Toys for Bob, I know you folks are really good at making toys. I'm sure this Bob guy is completely overjoyed. Your Skylanders game wasn't too shabby, and I'm really looking forward to the follow-up, Skylanders Giants. I love your work, but you really need to leave the character naming to the people most qualified: profession game journalists. 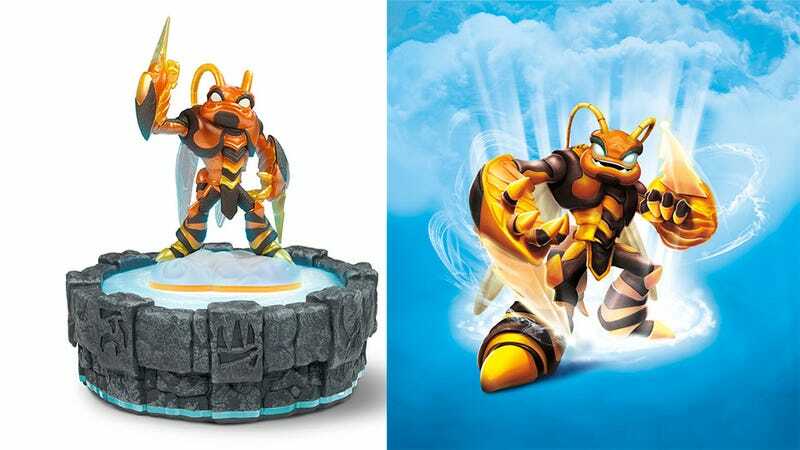 Take the latest giant Skylander, Swarm. I get where you were going with the name — he's a bee, and bees swarm. They also buzz, pollinate and sting, so I suppose we dodged three bullets before we got hit in the temple with Swarm. Swarm was once a prince from a proud race of mysterious insect warriors that had built their entire civilization inside a giant honeycombed pyramid. Growing up as one of the 9,000 members of the royal family, he was never permitted to leave the hive. But unlike his brethren, there was a magical quality to Swarm that caused him to grow much larger than the rest of his kind. No longer able to fit amongst the rest of his colony, the young prince broke the long standing tradition and stepped out into the open world - where his size and strength would be put to good use in the legendary battle between the Giants and the Arkeyans. Now if he was a single warrior that was somehow formed from a combination of all 9,000 members of the royal family then yeah, Swarm would have fit. What you are describing here, however, is Bee-Hemoth. I suppose it's too late now. Just keep me in mind should this horrific naming travesty not poison the chances of a third entry in the series. I promise to keep my consulting fees modest.